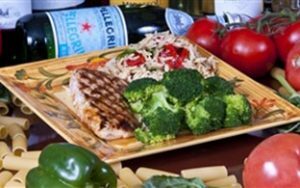 Fresh from the grill, you can enjoy delicious dishes on our restaurant menu when you visit Kelsey’s Pizza. These dishes on our restaurant menu are filling, delicious, and filled with flavor. Tender pieces of chicken breast marinated in vegetable oil, garlic, imported oregano & black pepper, skewered & grilled to perfection. 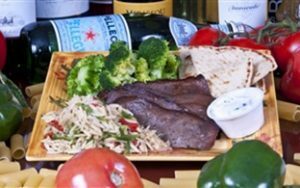 Served with a mini tossed salad, pita bread, orzo, garlic cucumber sauce & broccoli. 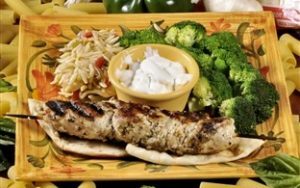 Served with slices of gyro meat, wedges of pita bread, broccoli, orzo pasta and garlic cucumber sauce. 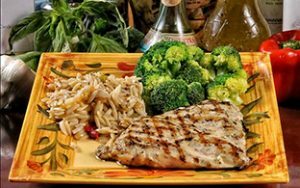 Grilled or blackened Mahi Mahi served with orzo, broccoli, and mini tossed salad & two slices of garlic bread. Chicken breast marinated in a traditional Greek recipe and slowly grilled to perfection. Served with a side of steamed broccoli and orzo.